Approximately 1 in 8 U.S. women will develop invasive breast cancer over the course of her lifetime. Sendero Cares and Sendero’s Wellness Committee recently partnered to champion Breast Cancer Awareness (BCA), a women’s health initiative that has touched the lives of many of our employees. Educate: To kick off the month, we hosted a Lunch and Learn, “Go Pink or Go Home,” featuring a representative from Susan G. Komen Dallas, who spoke on the origins of the Susan G. Komen Foundation, what they do for women in the Dallas community, and how to detect signs of breast cancer. Recognize: Employees had the opportunity to become a “BCA Champion,” where they shared their story of how breast cancer has affected their families that was captured in a moving video shared with all our employees. Employees spoke of mothers, grandmothers, and aunts who had bravely fought breast cancer and who showed them their strength in their battle. Sendero Cares sponsored the Race for the Cure registration fee for all of our Champions. Fundraise: Sendero’s Wellness Committee held a “Waffle War,” where members of our Senior Leadership Team competed for the title of “Sendero’s Best Waffle Maker.” By donating money to benefit our team in the Race for the Cure, employees were able to taste and vote on their favorite waffle. We also created a “Ribbon Wall” where Senderoans could donate $1 to place a commemorative pink ribbon to honor someone who has fought against breast cancer. 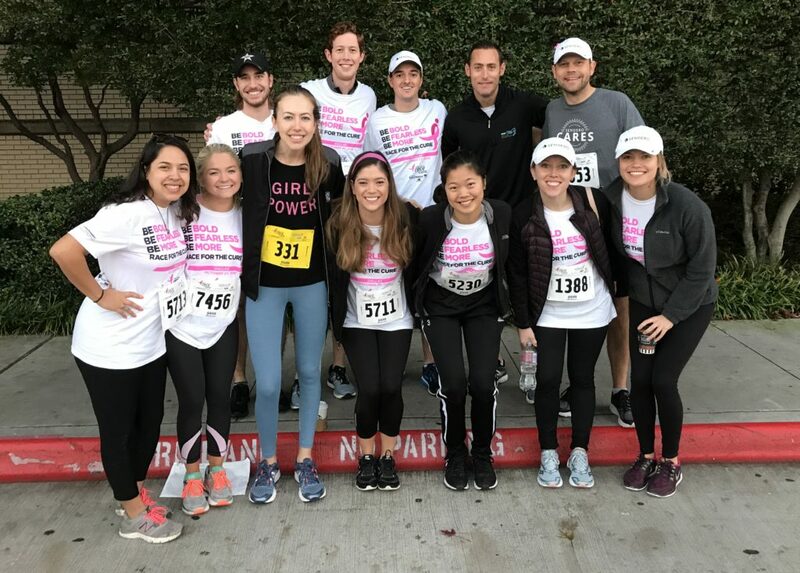 Match: To wrap up the month, a group of employees, friends, and family participated in the Dallas Race for the Cure, raising money for the Dallas chapter of Susan G. Komen that was matched dollar-for-dollar by Sendero Cares, doubling our total donations. The Wellness Committee and Sendero Cares are excited to be able to champion a cause that is close to the hearts of so many in our company. As part of Sendero's pro bono consulting effort, Community Rocks, provide our professional services to local non-profit organizations. With rapid growth on the horizon, Sendero recently worked alongside With Purpose, a coalition that raises funds and awareness for pediatric cancer research, to address organizational gaps and to help them scale accordingly. Chase’s Place, a Dallas-area special-needs school for students, has been close to the hearts of Sendero employees since becoming our first community partner in 2008. Sendero is proud to partner with Camp John Marc (CJM), an inspiring organization that provides a specialized camp experience for children, teens, and families living with chronic medical and physical challenges. Since its establishment in 1991, the number of CJM campers has grown from 500 to over 3000 on average per year. Through partnerships with Dallas-Ft. Worth area pediatric hospitals, and over 1,000 volunteers, each camper is able to experience high-quality camp activities with two-thirds of the cost subsidized through private funding. DALLAS, TX — Sendero Principal Eric McConnell and Manager Staci Thetford have been selected to receive the 2018 Community First Award: Sponsored by Parkland Foundation. This award recognizes exceptional young civic-minded leaders who have impacted Dallas County through their work in the community.